Organic farming is a year-round job. Our team at the Novo Fogo distillery in the small town of Morretes spends most of the year working to grow healthy sugarcane. We till the fields, tend to young sugarcane, and do our best to keep the jungle from encroaching the cane fields until harvest time. 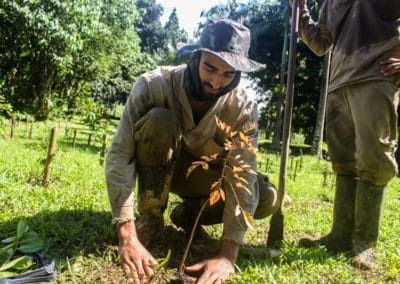 But in the last several months, our team has been planting something other than sugarcane on our property in Morretes: native and endangered trees. 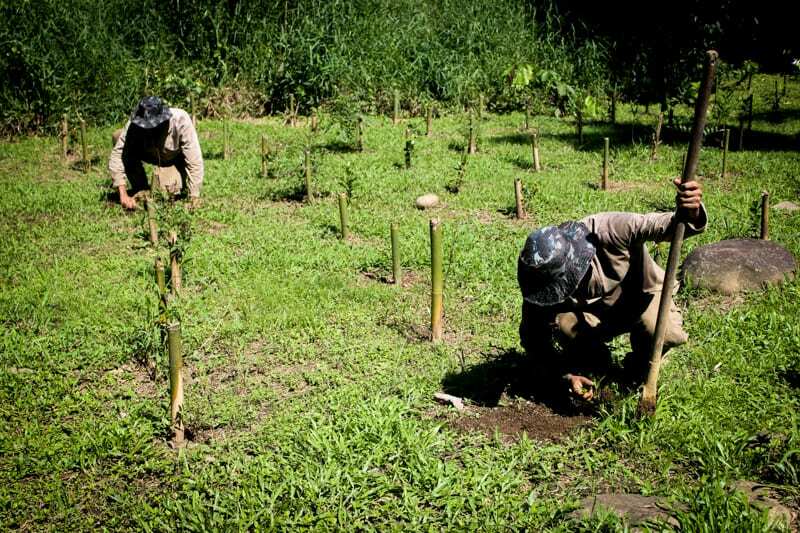 This year, we launched a reforestation project that we call the Un-Endangered Forest. You can read the full story here. The abbreviated version is that we learned through using Brazilian wood barrels to finish our cachaças that many of these Brazilian woods are terribly hard to acquire. Nearly all Brazilian woods used for aging cachaças are endangered at some level. These precious trees have fallen victim to rampant deforestation in Brazil. This hits home for us because of our farm’s symbiosis with the Atlantic Rainforest that surrounds our distillery and sugarcane farm. For Novo Fogo, Brazilian wood-aged cachaças serve as our way to call attention to deforestation in Brazil. But we wanted to do more, to take a more aggressive role in combating the loss of forest habitat in our region of the Atlantic Rainforest. 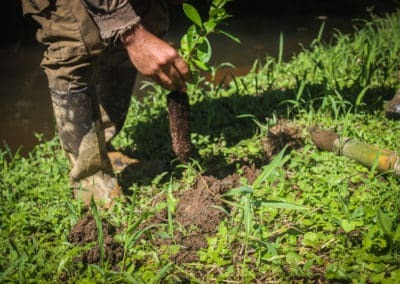 We partnered with local landowners in Morretes who own a private reserve in the jungle and we resolved to direct a portion of our revenues to planting trees in the private reserve as well as on our own property. This is an update on how we’ve been getting our hands dirty. 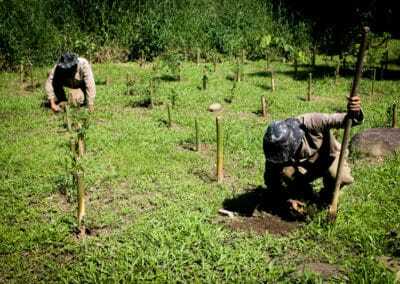 We launched the first stages of our Un-Endangered Forest project on our own land. A small creek crosses a grassy open space near the entrance to the Novo Fogo property. At first glance, this is an idyllic scene: the gurgling stream is flanked by waving palm trees and fragrant, white-flowered wild ginger. We learned from a botanist, however, that this is hardly a natural landscape! The palm trees are decorative, non-native Australian palms, and the wild ginger is actually an aggressively invasive plant from Asia that grows all over Brazil. This area along the stream has been our main target for planting native trees and removing invasive species. 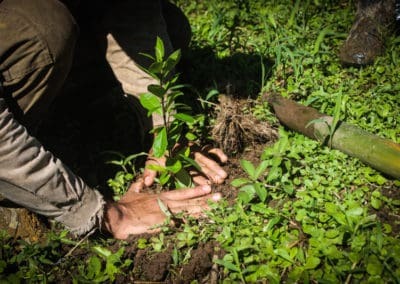 Our reforestation project has been guided by an expert Brazilian botanist, who advises us on which species of trees to plant as well as how and where to plant them. 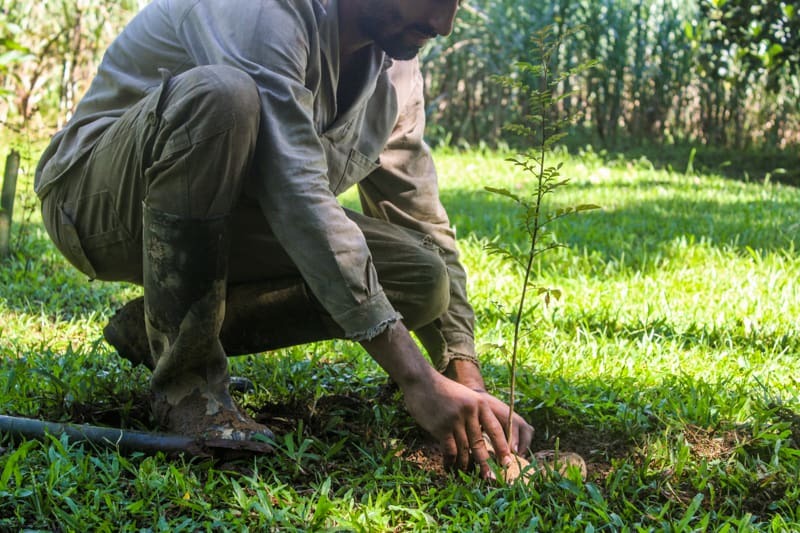 We acquire native tree seedlings from a local nursery called the Agronomic Institute of Paraná. 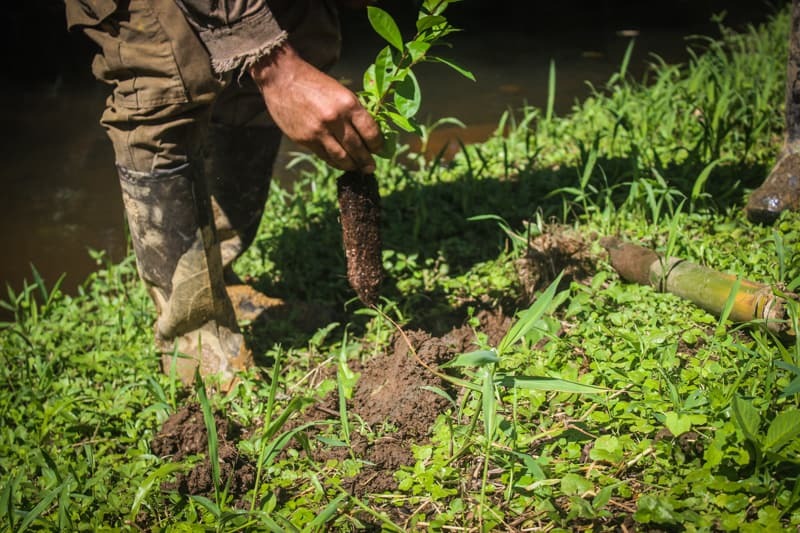 Our field team organizes the seedlings by species and plants them in the ground according to the amount of space each species requires to thrive. 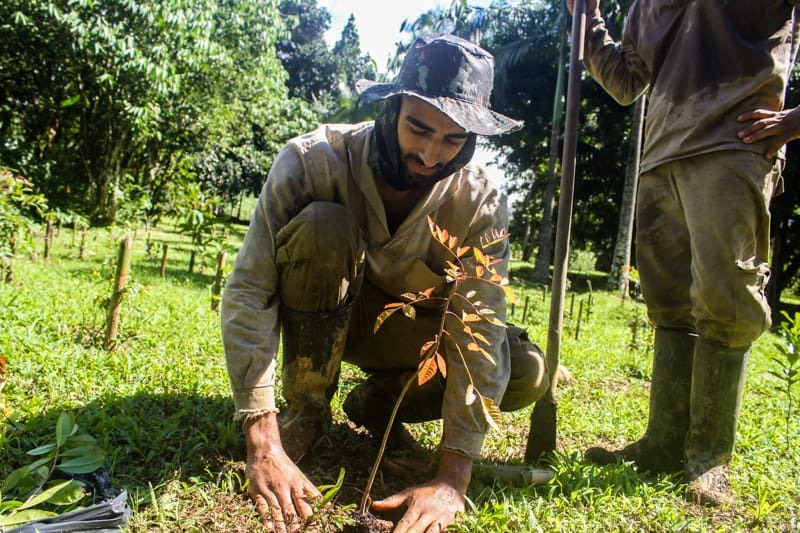 Remember, you can support our reforestation project by buying a Novo Fogo T-shirt here. 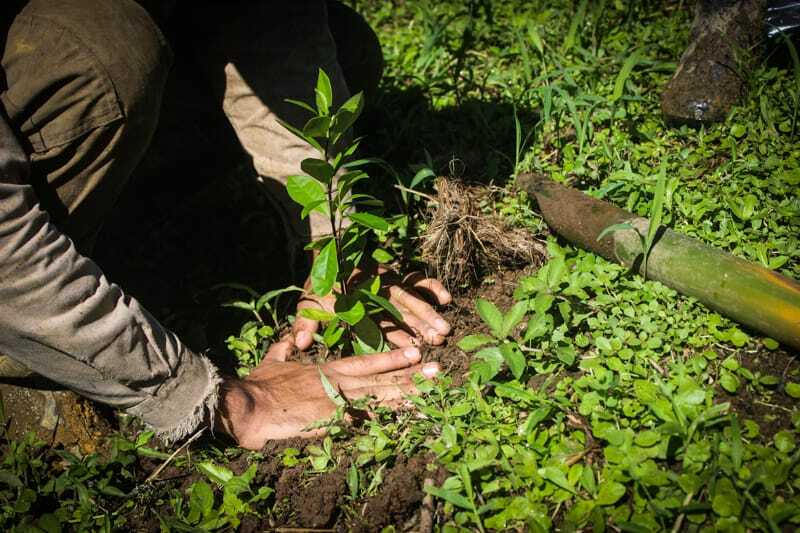 We look forward to sharing more updates as we plant more trees on our property and in our neighbor’s Private Reserve.